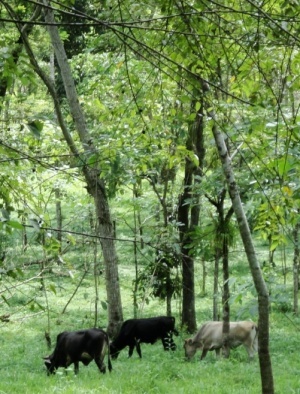 A World Bank-supported pilot project has demonstrated that several agrosilvopastoral technology innovations and systems developed and/or tested in Central America can be adapted to the Tugi (Gutah) Hills in the North West Region of Cameroon, resulting in the rehabilitation of degraded pasture lands, improved livestock productivity, increased income of the rural communities and reduced risk and vulnerability to climate change. The challenge now is to capture some of the lessons learned during the course of the Tugi Silvopastoral Project (TUSIP), a piloted South‐South Knowledge Transfer Cooperation between the Tropical Agriculture Research and Higher Education Centre (CATIE), based in Costa Rica, and Akwi Memorial Foundation (AMF) - an NGO based in the North West Region of Cameroon, launched in January 2011. For example, a gender mainstreaming component initiated in the second semester of the pilot to promote gender inclusion and avert the inherent gender-related “inequality of opportunity”, has demonstrated the relevance of incorporating village women groups, not only to participate in the implementation of agrosilvopastoral technology innovations, but more importantly to implement activities that respond more directly to their need for economic production and financial empowerment. The gender mainstreaming has created an environment for harmonious crop-tree-livestock integration whereby food crops, economic trees, and livestock are raised in association to promote the livelihoods of farm families. The successful rehabilitation of degraded lands and the intensification of crop-tree-livestock production systems in the project area is key to securing sustained food security and other livelihoods for the targeted farmer. The agro-silvo-pastoral technologies and innovations tested in the project area will build capacity for the farmers and introduce them to environmental services and strategies to cope with climate change. The success of the pilot also hinges on the appropriate implementation of value-chain approaches to better articulate agro-forestry as one of the way farmers and their organizations will reach niche markets. The 21 months of project implementation have generated concrete results from which lessons can be learned and disseminated for knowledge sharing, replication, and scaling up/out. and develop and implement a dissemination strategy that will convey the lessons learned to a wide and diversified group of stakeholders. This information will be useful to guide future south-south knowledge transfers that involve the grassroots and to explore potential donors for scaling up the pilot program.